Home /Featured/Slice of England in Brooklyn! 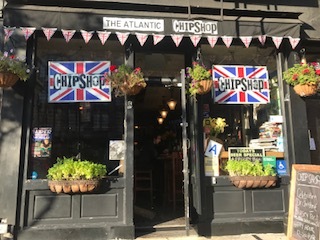 There is a slice of England in Brooklyn, called the Atlantic Chip Shop. Chip Shop is a great place to get some quick British food such as Cod and Chips, Welsh Rarebit, Shepards Pie or even a simple Mac and Cheese. 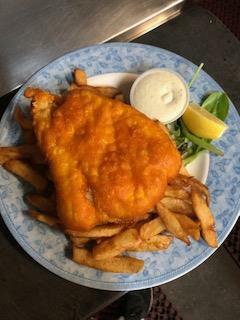 To all SFC students, staff, and faculty who enjoy eating downtown: we know there are many places to grab a quick lunch and go, but for those who’d rather sit down and enjoy their food on the spot, the Chip Shop is a must try! The restaurant plays classic English Rock. Customers can hear bands as the Beatles, Queen, Pink Floyd or even the more contemporary bands such as Coldplay. For those of you who don’t listen to classic rock, but enjoy watching sports, the Chip Shop has screens where customers can watch the latest soccer game or tennis match! With an order of Cod and Chips (Fish and Fries) and a Rock Shandy (British soda), and a dessert like “Sticky Toffee Pudding”, you are sure to leave satisfied! Some food options include: Cod Chips, Meaty Mac, Fried Pizza, Seafood Chowder, Chicken Fingers, Sausage, Beans and Chips, and Chicken Curry. Next time you’re walking around the neighbourhood, head to Clinton St. on Atlantic Ave. and enter the Chip Shop!